Helping people live their best lives – by preventing injuries, growing stronger, and treating the whole person – is the mission of Capital Chiropractic & Rehabilitation Center. 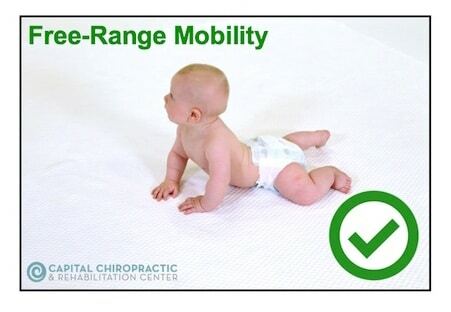 That includes helping the youngest among us build a strong foundation of mobility, coordination, and neuromotor stabilization from the earliest days of their lives. 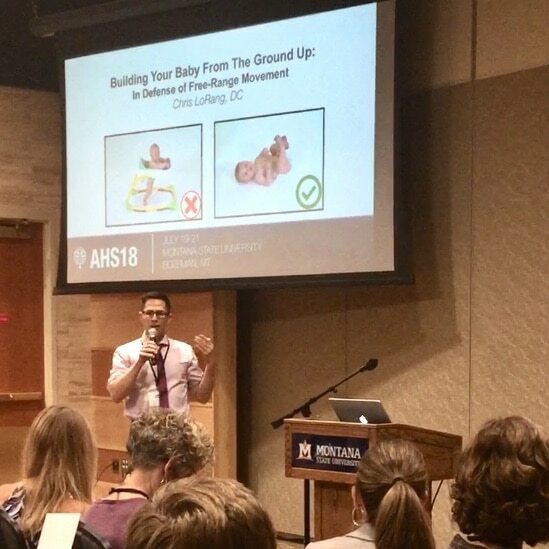 To bring more attention to the research supporting this concept, Dr. Chris LoRang was honored to present at the 2018 Ancestral Health Symposium in Bozeman, Montana. 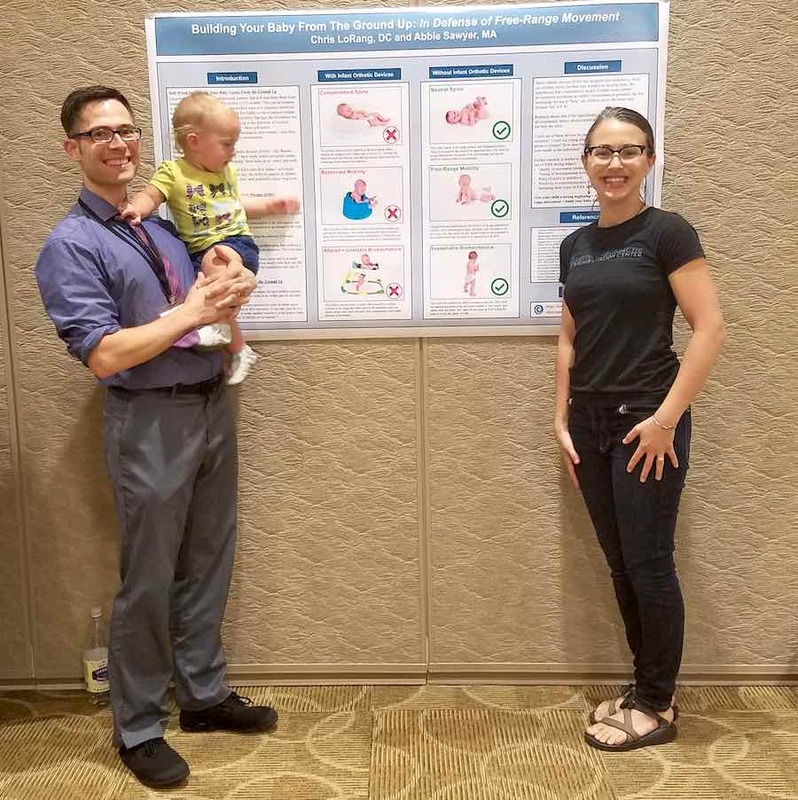 “Building Your Baby From the Ground Up: In Defense of Free-Range Movement” is a less-is-more concept that has become a passion and focus of Dr. LoRang’s clinical work with infants and families. Dr. Chris LoRang presents at Ancestral Health Symposium in Bozeman, Montana. Dr. LoRang and Abbie Sawyer presenting the research poster at the Symposium. The thesis of the presentation is simple: forgo infant orthotic devices (IODs) like Bumbo Seats, jumpers, walkers, and exercausers as your infant develops from birth to 15 months. Research has shown that these IODs alter how infants’ soft-wired motor pattern development is executed. In fact, the artificial support to infants’ limbs and spine has been shown to delay, alter, and potentially cause long-term motor pattern dysfunction. Instead, research suggests is better to create an environment where your child can move freely on a flat, safe surface with a loving adult. Building your baby from the ground up is easier than you might think. Simply put babes on the floor instead of in Infant Orthotic Devices (IODs) like Bumbo Seats, walkers, exercausers, jumpers. And resist the temptation to hold their hands to “help” them walk or prop them up to “sit” before they can do so independently. Babies are soft-wired to develop all on their own in an amazing pattern that has evolved over millennia. The “From the Ground Up” approach lets them do their thing all the way to walking and they’ll be all the stronger for it. Follow the Capital Chiropractic Instagram feed (@capitalchirodsm) for more updates on this topic. Learn more about the Building Your Baby from the Ground Up presentation. Purchase a copy of the original Building Your Baby from the Ground Up poster. If you’re interested in the Spanish translation, email abbie@capitalchirodsm.com. Have questions about your own child’s development? Reach us at the clinic at 515-421-4018 or office@capitalchirodsm.com.